Improviso is an exciting and versatile young quartet formed in 2015 at the Royal College of Music in London. 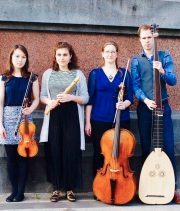 They explore historically informed improvisation alongside performing chamber music of the seventeenth and eighteenth centuries. 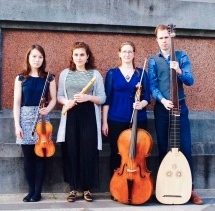 Praised for their inventive programming and exciting stage presence, Improviso has appeared recently at the Styriarte Festival in Austria, Bad Liebenwerda in Germany and at venues in the UK, including London’s Wigmore Hall where they are Chamber Tots Ensemble in Residence. For 2018 they have been awarded a chamber music residency at Snape Maltings, Aldeburgh. Season tickets to all six concerts in the 2018 SJE Arts Next Generation Series available at over 30% discount: £70 Centre, £60 Side Aisle.